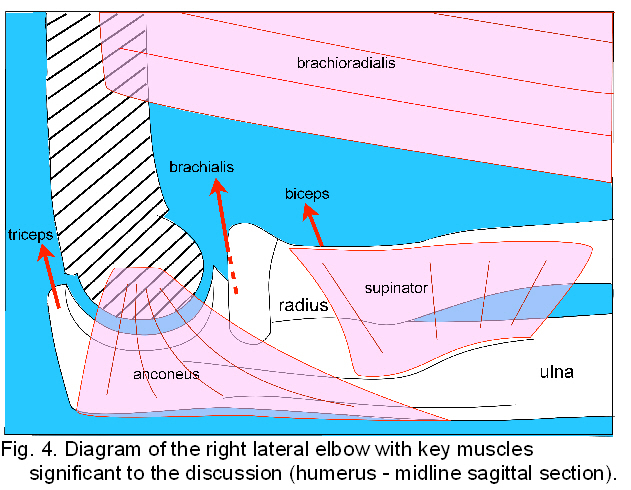 Read here about the human elbow as considered from the perspective of tensegrity. 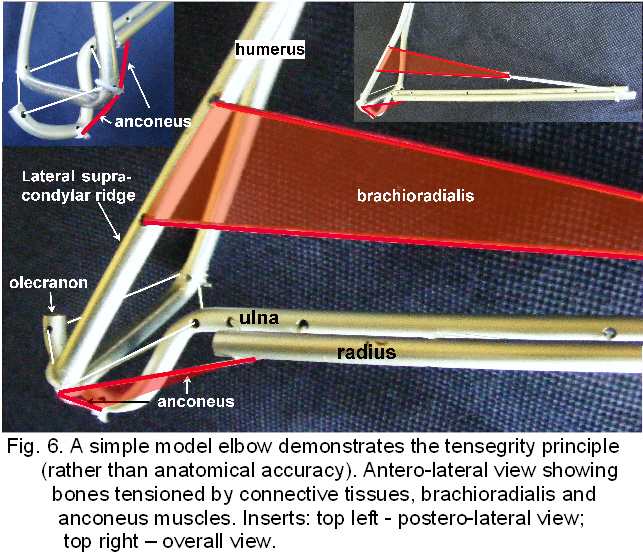 Graham Scarr published an article considering the elbow as a tensegrity structure. The idea of a joint functioning as a unit because of global tension rather than piecemeal activity of its components has been around for some time9 but it is only recently that the anatomical details supporting multiple tension pathways have been recognized.37,38,45-49 The essence of a tensegrity system is that every component contributes to structural stability throughout movement, rather than a ‘flexor’ pulling one way, ‘extensor’ the other, and ligaments limiting motion. Numerous muscular expansions into the fascia and smooth muscle cells within it maintain a constant basal pre-tension in-vivo even at rest,37,53 a pre-requisite to tensegrity and one of the reasons why cadaver experiments have their limitations. As tension always reduces itself to a minimum and equilibrates throughout the system, reciprocal interactions between muscles and connective tissues, if arranged in a tensegrity configuration, would provide the most energy efficient means of moving the joint and maintain stiffness and stability.11-14,66,67 This outsourcing of complex control tasks directly into the structure reduces the effort needed to coordinate changes49,77,78 with muscles refining movement at a higher level of control. It may be that variations in muscle and fascial connections between individuals are structural alternatives that efficiently reduce unnecessary redundancy during early development. Tensegrity is a complete and inclusive structural system, and the elbow as such would mechanically rely on the whole limb in order to function normally, which in turn would depend on the entire body interacting in a reciprocal way. Postural abnormalities, misuse and injury in tissues some distance away could affect structures around the elbow, causing changes in local tensional balance and paradoxical proprioceptive activity during movement.49,54,55 A neurally mediated response through the muscle system may attempt to compensate for this but connective tissues take longer to adapt and are relatively passive;52,53 consequently, dynamic stability of the joint and tensegrity system could be compromised, at least temporarily. Unless this is resolved, nociceptive signalling is likely to increase under certain loading conditions and may give rise to the symptoms of such vague pathologies as ‘tennis elbow’ and ‘repetitive strain injury’. If this situation continues, the normal relationship between joint surfaces and tissues under tension might change irreversibly, ultimately leading to structural changes in soft tissues, bone and cartilage that characterise ‘osteoarthrosis’. If the elbow is part of a global tensegrity configuration, each component will be contributing to its function throughout normal movement,13,51 and any ‘aberrant’ mechanical or neural signal has the potential to compromise it. The tensegrity concept is compatible with the view of the body as a complex mechanical unit and the principles of manual treatment used to restore normality to the elbow and other joints. See also the page on Graham Scarr . This page was last edited on 24 November 2018, at 09:44.